Good morning! I’ve been thinking of resurrecting my little ‘Feature My Food Fridays’ series for ages, and it’s an honour to start again with the lovely people at My Little Sous Chef. I first heard about My Little Sous Chef almost two years ago, when Caterina, Francesca and Laura were crowdfunding for their project. 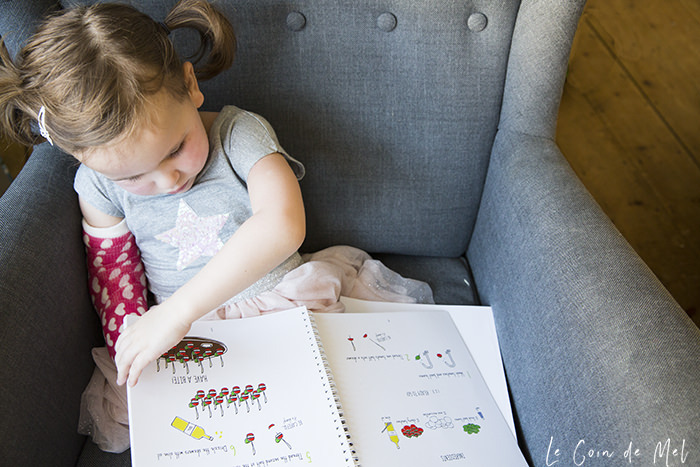 My Little Sous Chef is a tandem cookbook for parents and children to cook together. It’s unlike anything I’ve seen before. It comes as a set of two cookbooks, which include the same recipes and work seamlessly together. The adult’s cookbook looks like any other recipe book, with detailed ingredients lists, instructions and good photos, whilst the children’s version focuses on simplified steps that children can follow to help make each recipe. The children’s version is laminated and easy to wipe clean. I always find that when my children get fussy about food, the best way to help them overcome food aversions and pickiness is to get them cooking dinners with me. They tend to be a lot less reluctant to try something they’ve made themselves! My Little Sous Chef is available here for £22. Enough of my chit-chat. Over to you, ladies! We are three friends, Caterina, Francesca and Laura. 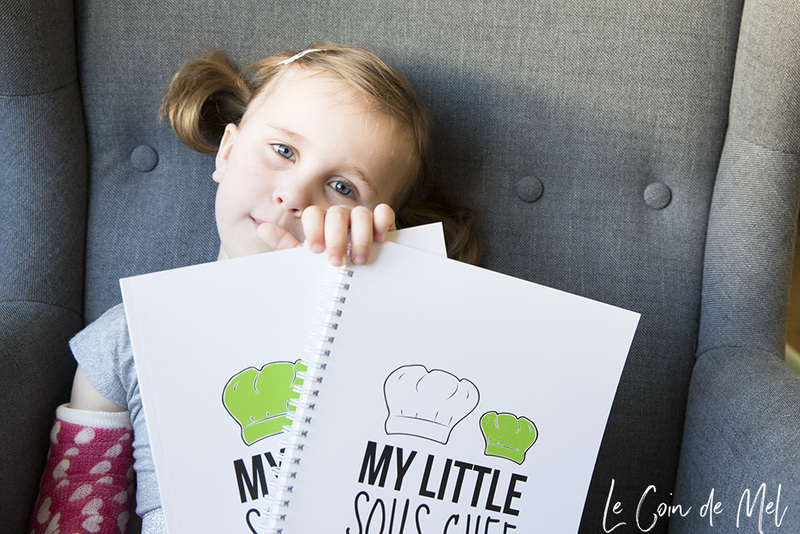 We wrote and produced an innovative cookbook, called My Little Sous-Chef. It’s conceived to encourage parents and kids to cook together and have fun creating yummy, healthy meals. We had this idea while reminiscing about helping our mothers or grannies in the kitchen and realise and realised there was no book that reflected that, so we made it! A lot of our recipes come from our childhood, so the gnocchi for example, and the aubergine sandwiches; we also drew inspiration from London’s diverse culinary scene, but mainly we wanted to feature recipes that could offer kids a lot of tasks to get hands-on cooking. Is there anything you would not touch even if you were given £1,000 to eat it? Can you give us an anecdote about food? Once we had people for dinner and we decided to cook spaghetti alla carbonara, which is usually a crowd pleaser and very simple: pancetta, egg and some parmesan cheese…only, the eggs are to be used raw (and super fresh, obviously! ), and one of our guest didn’t know that. When he found out, he was very uncomfortable with the idea, but he mustered his courage and had a bite and loved it, so it was a success anyway. The best way is surely to cook for others and share a meal together. It’s fun to see their reaction when they take the first bite, especially if you know you nailed the recipe…if you are planning to feed them raw eggs though, give them a heads up! Could you share a couple of tips that make your life easier in the kitchen? When you try a new recipe, it’s quite helpful to read it a couple of times beforehand and visualise the different steps, so when you actually do it you will have it already memorised and it will flow more easily. Also, it’s always nice to have some music on. 1 thing no one should ever do in the kitchen? There should be no rules in the kitchen, aside from the safety ones! Keep your kids away from the oven and have pan handles facing the inside and just have fun: feel free to experiment in the kitchen, combine flavours, swap one thing for another, taste everything! Which recipe did you choose to share and why? We want you try our gnocchi recipe! It’s super easy to make and the kids will love getting their hands sticky while mixing the dough. It’s basically play dough, but you can eat it! Wash the potatoes and place in a pan of salted boiling water. Let them boil for about 15 minutes, until a knife can easily cut through one. Drain the potatoes, peel and mash them with a potato masher or a fork. Mix the mashed potatoes with the salt, flour and egg until you get a smooth dough, with no lumps. Divide the dough into three. The first part will be used for the white gnocchi and doesn’t need any other ingredients. Add the pesto to the second part to make green gnocchi, and the tomato paste to the third one, for red gnocchi. Mix again until the sauces are well blended in the dough. On a lightly floured surface, shape the dough into a long wide sausage for cutting. Cut the sausage into about ten pieces and roll each piece into long cylinders about 1cm thick. Keep the surface well floured as you don’t want the gnocchi to stick. Cut the dough into pieces roughly 3cm long. Place them on a tray already dusted with flour. If you want your gnocchi to have the typical stripe pattern, roll them gently on the prongs of a fork. Let them sit for 15 minutes. Melt the butter in a pan on low heat and add the sage leaves. Cook for a few seconds. Once the butter is browned add a spoonful of water, salt and pepper and remove from heat. Cook the gnocchi by boiling them in a pan of salted water for a few minutes, until they raise to the surface. Drain and toss them in the pan with the butter. Use floury potatoes, like Marfona or King Edward. 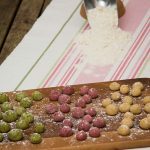 For pink gnocchi, mix the dough two boiled and mashed beetroots. For orange gnocchi, mix with one boiled and mashed butternut squash. Add pesto for green gnocchi or tomato puree for red gnocchi. Add the salt, egg and flour and knead. Divide the dough into three bowls and set one aside. Add pesto to the second bowl and tomato puree to the third one. Roll the dough into long sausages on a chopping board. I have teamed up with My Little Sous Chef to give one lucky reader a copy of the tandem cookbook. You can pick and choose a range of ways in which to enter. The only one you must click on to get into the draw is the one asking you to leave a blog post comment. You must also leave a comment telling me what was the last recipe you made with a child. Entries are open until 23.59 p.m. GMT time on Sunday 1st July 2018. Good luck! Disclosure: I was sent My Little Sous Chef for the purpose of this feature, but I wasn’t compensated in any way for this blog post. I genuinely believe in the concept behind My Little Sous Chef and think children should be involved in the kitchen every day! I think it was probably chocolate chip cookies with my little one. My granddaughter & I made pancakes: she mashed a banana, broke an egg and beat it with milk, added the banana and floyr, and I cooked them. Chocolate cupcakes were the last thing we cooked / baked. Me and our eldest made a banana and chocolate Pikachu birthday cake for his little brothers birthday. It went down a treat! Fairy cakes 😀 Thanks for running this comp.